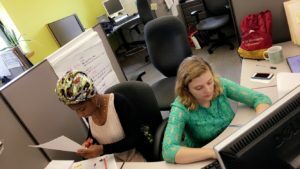 Eureka Interns Janaan and Julia, working in their shared cubicle. Evaluation organizations play a crucial role in advancing equity by promoting and practicing participatory processes that involve those most affected by the research questions. Evaluation organizations can expand on that work by creating pathways for youth of color and individuals underrepresented in the evaluation field. 1.) Providing evaluation capacity building directly with youth participants from partnering community organizations. 2.) Working with a team of young adults on participatory evaluation projects. 3.) Hosting high school and college evaluation interns. Learn more about Rainbow Research’s Capacity Building as Part of Pathway to Build Diversity in the Evaluation Field. 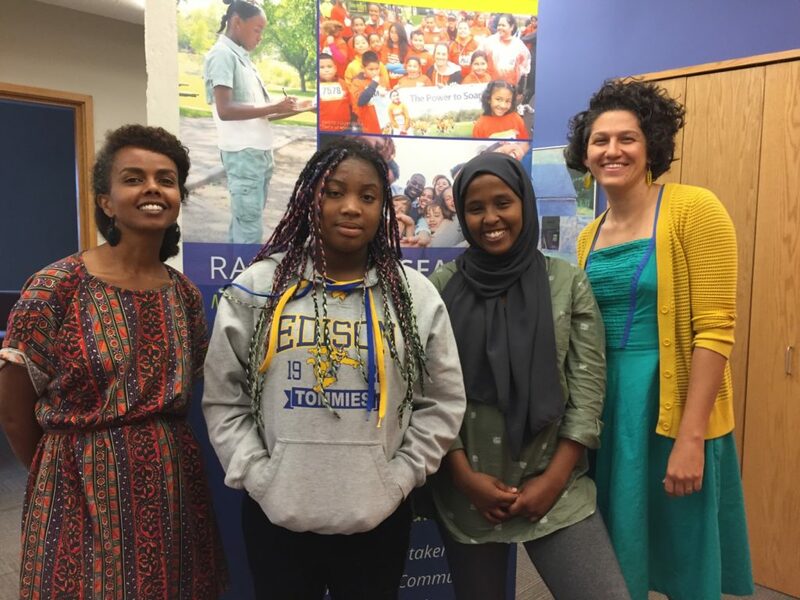 Summer 2018 high school interns Faith & Asha, with Rainbow Research Associates Selam Tilahun & Katie Fritz Fogel. Faith and Asha spent four weeks working alongside Rainbow staff practicing evaluation methods. 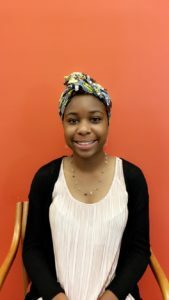 In addition to joining staff at meetings with clients, Faith and Asha were responsible for taking photos about menthol advertising in the community and interviewing peers about their perceptions of menthol tobacco use and access to menthol tobacco products. They were also responsible for creating online survey tools, doing data entry for over 100 youth interviews, and summarizing data. During the summer of 2017 we had the opportunity to host two young women through the YWCA of Minneapolis Girls Inc. Eureka! internship program. Janaan and Julia spent 6 weeks working with Rainbow Research staff learning about different evaluation and research tools, what happens with data after it’s collected and how to make meaning from information. My role at Rainbow Research as an intern was to conduct focus groups and interviews with youth program participants to gain feedback and to analyze data. Also my role was to develop research questions to identify outcomes. Strengths that I brought to this internship are my communication skills, hard work and dedication, creativity, purpose, self-motivation, and my innovative thinking. I was interested in gaining community feedback and improving changing structures. I was also interested in actively engaging in conversations that increase knowledge, lead to action, and make an impact. What I learned from this experience was how to collect data, and define and know the differences between qualitative and quantitative data. In addition, I learned how to have good work ethic. Another thing I learned was what research and evaluation mean, and how they can be conducted. The most important thing to me that I learned was how to ask questions to get people thinking, and to gain answers that are relevant to reflect and discuss how to improve specific things. This experience will influence other aspects of my life abundantly. Not only school, but future jobs and careers. This experience will also influence how I conduct focus groups at school with my peers and staff. An example would be conducting focus groups at school to understand benefits from any structural ideas and how to analyze that data, and propose to the admin and back to my school community. This experience will change the way I think about the Eureka! program in many different ways. I now know how others in the program benefit, and the deeper meaning of STEM. I also know what kind of impact it has on us, and what the program does with constructed feedback. 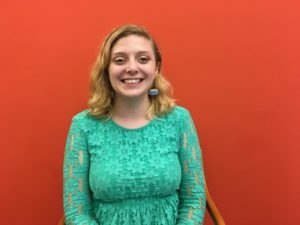 Being an intern at Rainbow Research has given me a direct insight on how organizations analyze their data on development and outcomes of their participants. I would describe the Rainbow Research work culture as a conflict free and welcoming environment, not only are the employees at Rainbow Research co-workers, but they are also friends and keep each other connected in their personal lives. The culture here is definitely a place I’d feel comfortable having a real job at. Rainbow Research conducts a wide array of local, regional, and national research and evaluations. To do so, they write grants and receive financial support to provide for their nonprofit, and to kick off projects for clients. They collect data in many different ways including focus groups, surveys, interviews, and cultural engagement. I have grown tremendously in my personal development and work ethic skills. I know how to do research and collect data in different methodologies. The flexibility here has made me more comfortable and confident in my ability to get work done and to improve on my time management. Without this experience which I am grateful enough to have I wouldn’t know how to ask relevant/ more in depth questions. This experience has been one I will forever use and remember. These four weeks have been amazing and I cannot complain or give improvement suggestions. As an Intern I made phone calls, conducted focus groups and analyzed data and helped staff with whatever they needed. I had phone interviews with several YWCA alumni and led two focus groups with girls currently in the Girls Inc. at YWCA Minneapolis Eureka! program. I am a hard worker and I came willing and excited to work. I was interested in STEM when I came to this job, and I got to do some of that through getting data and evaluating it. 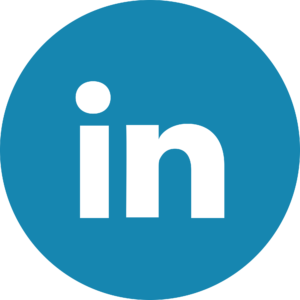 I learned about evaluation, and how to conduct a focus group. I got a lot better at talking to people on the phone, and I learned about confidentiality when conducting experiments. I learned basic skills here that I will need when I get another job or in school. Additional skills I learned include: being professional and polite, time management, dressing professionally, working with deadlines, and just the whole idea of having a boss. I’m less critical of Eureka! now. Whenever we did something I did not like I always complained and was like, man they need to get it together! But now I’m realizing more that it’s really hard to run a brand new program, they did not have any practice rounds, to an extent they’re making stuff up as they go. I also realized that they are really trying to improve for the years to come, and hiring Rainbow Research for data collection shows just that. The office culture at Rainbow Research is best described in one word: chill. There is music playing sometimes, free chocolate and popcorn for public consumption in the kitchen, and people are unbelievably nice and understanding. Also it’s currently all women who work there so that added another level of comfort for me. I do wish people would go outside to eat more though; people mostly eat at their desks. Nonprofits and companies, generally local, hire Rainbow Research to help them improve in some way, or help them get needed information.